The following article was published in 2012 when I was seeking a publishing company for my 2nd book. I have since published my 6th book to wide acclaim without their help. If you bash your head against a wall long enough and hard enough, eventually you make a small hole in it. With a bit of luck, a hole in the wall too… Right now, I seem to be peering through the tiny hole I’ve made in a wall, on the other side of which lies the Bright and Shining World of Authorial Success. It’s a very small hole. My name’s Justin Sheedy. My first book, Goodbye Crackernight (a portrait of growing up in 1970s Australia), was published at the end of 2009. Yes, it needed a NSW Writers’ Centre Mentorship Program manuscript assessment to transform it from good but unpublishable raw material into an actual decent read and, yes, I had to have a new brain fitted after the ordeal of the transformation but that was well worth it. …a continuum of hard work, knock-backs and general head-against-wall bashing. My latest book is entitled Nor the Years Condemn. It’s an historical fiction based on the stunning true Australian story of how the best and brightest of a generation ironically picked one of the fastest ways to die in World War II. And won it. This book, too, only became the book it should be after a NSWWC Mentorship Program assessment. …And I had my second new brain fitted in as many years. By 2011, now being able to ring Australia’s major publishing houses and say the magic words, ‘published author’, I was able to get past reception at all of them and onto their commissioning editors. Each of whom said Nor the Years Condemn sounded great, ‘Please send it in’, and proceeded to reject it one after the other over the course of 2011. By the end of the year, however, having attended a Byron Bay Writers’ Festival E-Publishing info seminar subtitled ‘Bypassing the Gatekeeper’, I published Nor the Years Condemn as an ebook, then in January this year as a print-on-demand paperback at Amazon. Yet back to work must I.
NSW Writers’ Centre member READER FEEDBACK on the above article. (Writes Portia Lindsay of the NSW Writers’ Centre: “I just wanted to pass on some lovely feedback from one of the readers.”) “Hi there! I found Justin’s story absolutely spot on – honest, inspirational and simply wonderful! Kindly pass my comment on. May you fly, Justin! Ayshe”. My massive thank you to Ayshe, NSW Writers’ Centre member. 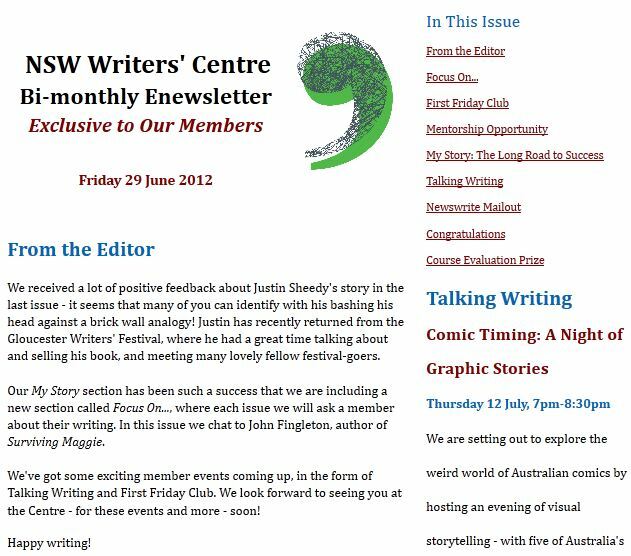 FOLLOW UP in June 2012 NSW Writers’ Centre Enewsletter! – Massive thanks to Editor Portia Lindsay.